This year we are excited to announce a new version of the Fellowship scheme. 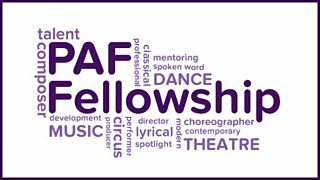 Over the past three years we have offered Fellowships in dance, music and theatre. Now we are opening up the scheme so that organisations from across the world of the performing arts can apply to host an emerging talent for a year. We are looking for applications from organisations that can offer development opportunities, support and training from all genres of the performing arts. From dance, music and theatre to opera, spoken word, circus and puppetry, we are interested in hearing from organisations across the UK and Northern Ireland. You can be a theatre, a dance company, an orchestra, a venue or any not for profit arts organisation. You may be a large institution with a host of contacts or resources to share. Or you may be a small team willing to open up your organisation to give an opportunity to someone that you haven’t worked with before. And the Fund will provide £10,000 per organisation to make this happen. We are asking organisations to look around at creative talent that are new to your organisation. The Fellow should have a track record and be ready to make the jump to the next level, whether that is a directing, choreographing, producing, writing, composing or performing. The organisation will help them realise their ambition and provide the resource, support and opportunity to make that happen. Find the Terms & Conditions on the PAF Fellowship grant page, where you'll also see some useful resources like tips and FAQs. You might also find this blog about how Unlimited Theatre found their Fellow for last year's Theatre Fellowship scheme useful. The BBC Performing Arts Fund is a charity committed to developing new performing arts talent from across the UK. This blog provides the latest news on our grant-making, as well as tips and advice from experts in the business and updates on previous grant winners.